One area in the interior that always seems to show alot of wear is the gauge cluster and shift plate. The bezel gets scratched along with the lense just from normal use. The shifter plate gets worn, scratched or even cracked. A lot of owners do not want to work on these areas because they are worried about disturbing or damaging the gauges. Well, you shouldn’t be. They are fairly easy to remove and even easier to restore. Zip Corvette Parts , 8067 Fast Lane, Mechanicsville, VA 23111, (800) 962-9632 , has almost everything you would need from bezels to sockets. Our Project 77’s gauge cluster was really showing its age. The lenses were scratched, the bezel was worn and the shifter plate was dented. With one call to Zip’s, we received all of the parts we needed and easily restored the cluster and shifter plate in one afternoon. Now let’s get our hands dirty! 01:Here is everything we needed for our dash restoration: the gauge bezel and lens, gauge gaskets, air conditioner duct seals, shift plate, console screws, clock knob and sleeve, ashtray cover and console light lens kit. 02: Start by disconnecting the battery. Remove the console side panels, radio knobs and nuts, gauge cluster screws and shift plate to gauge cluster screws. 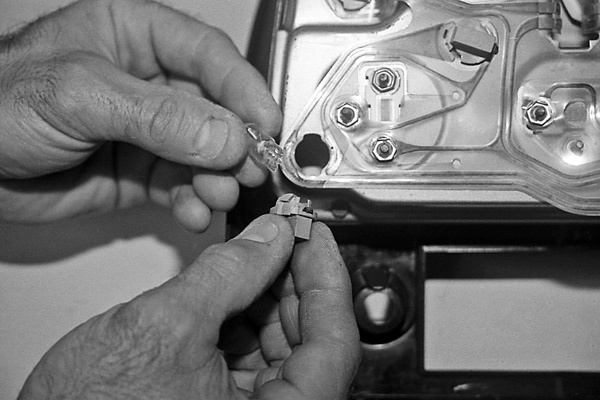 03: When all of the mounting screws are removed, carefully pull the gauge cluster out and disconnect the wiring harness plug. Push the two tabs toward each other at the top of the plug to release it from the cluster. Also disconnect the map/courtesy light assembly. Now remove the cluster from the car. 04: Remove the shifter knob and hardware. Unscrew the temp control bezel retaining screws to remove the shift plate. The temp control bezel should also be removed from the control assembly so that it can be restored. 05: Start the disassembly of the gauge cluster by removing the clock knob and sleeve. 06: Now remove the gauge cluster retaining screws on the back of the bezel and carefully pull off the gauge cluster. 07: Remove the map and gauge light assembly from the top of the gauge bezel. 08: Carefully remove the air conditioner duct retaining clips and remove the adjusting ducts. If the ducts are broken, contact Zip. They have them in stock. 09: Use a soft brush to clean off the gauges. If any are defective, now is the time to replace them. Zip can help you here. 10: We wanted everything to look new so we refinished the gauge face spacer. Thoroughly clean it then wipe it off with 3M’s General Purpose Cleaner #08984. Now refinish it with a Semi-Gloss Black. 11: While you are at it, thoroughly clean the temp control bezel with any type of spray cleaner, such as Fantastic, and a soft toothbrush. After it is dry, refinish it with Semi-Gloss Black. 12: When the bezel is thoroughly dry, use One Shot Letter Enamel to repaint all of the information that was on it. Silver for the lettering. Red, Light Blue, and Medium Blue for the temperature range. 13: Start the gauge cluster reassembly by installing the air conditioner duct seals. These have a self-stick adhesive and are easy to put into place. 14: Re-install the air conditioner ducts and push the retaining clips back into place properly before you attach the clips. 15: Now install the new lens into the map/courtesy light and re-attach it to the large bezel. 16: You will notice that the new gauge bezel does not have a hole for the clock stem. This has to be drilled. Place the gauge lens into place onto the bezel. Now mark the clock stem opening on the back of the gauge bezel. 17: Now remove the gauge lens. Put a 3/16” drill bit into a reversible drill and using your mark; carefully drill a hole into the bezel with the drill in reverse. This may sound dumb but with the drill in reverse, you will not turn a high RPM with the drill bit and not melt the plastic. 18: Install the gauge lens gasket and the red information lenses into place. 19: Place the gauge face spacer and information lens fillers into place on the new lens. 20: Carefully align the gauge cluster with the gauge face spacer and set it into place. When you are sure everything is aligned, re-install the mounting screws. 21: Install the clock knob and sleeve. 22: Re-assemble the shifter plate. Install the shift boot, ashtray cover, lighter socket and shift pattern indicator. 23: Before you re-install the gauge assembly, check all of the bulbs and replace any that are broken or burned out. They are a #194 bulb and are available at most auto parts stores. 24: Place the restored temp control bezel back into place and then re-install the shifter plate. 25: Place the gauge cluster into the dash. Reconnect the wiring harness and map light wiring. Re-install the radio and all of the attaching screws. Helpful Hint: Before you finish the reassembly, reconnect the battery and check all of your lights, gauges, switches, and radio. It is much easier to repair now than after you have put everything back into place. 26: If everything checks out, replace the console side covers and shift knob and hardware. 27: Here is the completed gauge cluster and console all restored and ready for the road again.